As reported by primary caregivers. Source: CICH graphic created using data from the First Nations Regional Longitudinal Health Survey (RHS) 2008/10, National report on adults, youth and children living in First Nations Communities. https://fnigc.ca/sites/default/files/docs/first_nations_regional_health_survey_rhs_2008-10_-_national_report.pdf -accessed August 2, 2017. 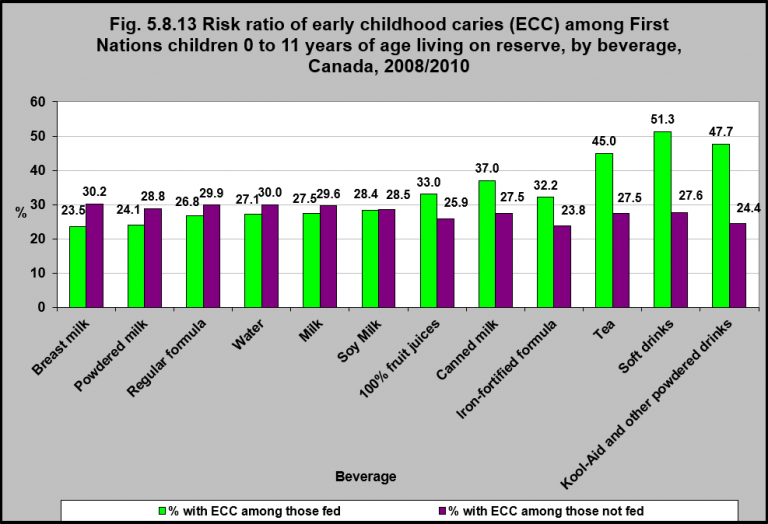 In 2008/2010, First Nations children aged 0 to 11 living on reserve who drank fruit juices, canned milk, iron-fortified formula, tea, soft drinks and powdered drinks were at greater risk of developing early childhood caries** (ECC) than those who did not consume these beverages. For more information please see the Early childhood tooth decay factsheet developed by the National Collaborating Centre on Aboriginal Health and the Canadian Paediatric Society’s Position Statement on Early Childhood Caries in Indigenous Communities. 12006 Aboriginal Children`s Survey. http://www.statcan.gc.ca/pub/82-003-x/2013004/article/11776-eng.htm-accessed August 24, 2017. 2The International Polar Year Nunavut Inuit Child Health Survey 2007-2008. http://www.inuithealthsurvey.ca/pdf/Child_Inuit_Health_Survey_Aug_31.pdf-accessed August 5, 2017. 3Garriguet, Didier. Beverage consumption of children and teens. 2008. Component of Statistics Canada Catalogue no. 82-003-x. Health Reports. http://publications.gc.ca/collections/collection_2008/statcan/82-003-X/82-003-x2008004-eng.pdf– accessed August 10, 2017. 4American Academy of Pediatric Dentistry. Definition of early childhood caries (ECC). Pediatr Dent 2005;27(7 Reference Manual):13. http://www.aapd.org/media/policies_guidelines/p_eccclassifications.pdf– accessed July 12, 2017. 5Position Statement – Early Childhood caries in Indigenous communities. 2016. Canadian Paediatric Society. JD Irvine, S Holve, D Krol, R Schroth; Canadian Paediatric Society , First Nations, Inuit and Métis Health Committee. http://www.cps.ca/en/documents/position/oral-health-indigenous-communities-accessed August 2, 2017.